This was a follow-on of ECT's 16K RAM board it came out rather late in the S-100 era. 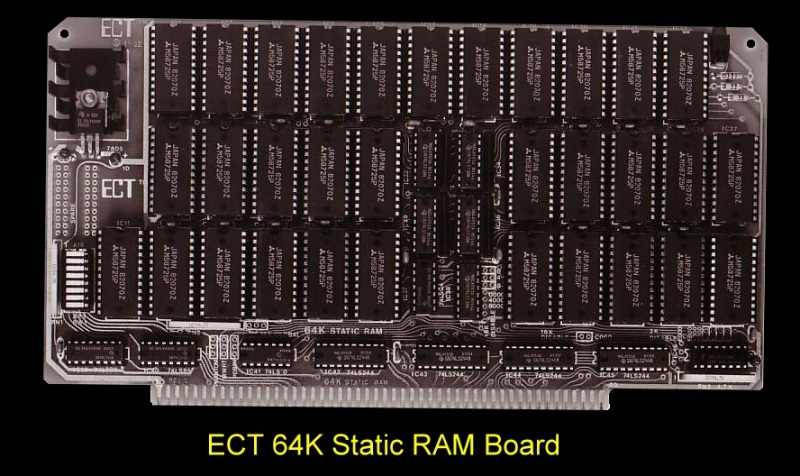 ELECTRONIC CONTROL TECHNOLOGY, Inc.'s 64K RAM was a low power fully static 64K x 8 bit S-100 bus memory board which utilized a single supply 2K x 8 bit fully static memory IC with the same pinout as 2716 EPROMs, therefore ROM could be intermixed with the RAM. A DIP switch provided 24 bit extended addressing selection of the board on 64K boundaries; or the board could be used on just a 16 bit address. For multi-user systems, 16K could remain global while 48K responded to extended addressing. Portions of the board could be disabled (for memory-mapped disk controllers or ROM) in 2K blocks above E000, in 16K blocks, or in any 2K block with jumper wires, or in any block or single address by phantom. All signals to MOS devices were buffered by low power TTL to prevent damage by static electricity and to minimize capacitive loading on the bus. 8080, Z-80 or other CPU's could operate at 2 MHz or 4 MHz (DC to 10 MHz under certain conditions). Low profile IC sockets were provided for all IC's. Here is a copy of the manual for this board.